Monday night at the Buubble was awesome. The place we stayed at on Snæfellsnes Peninsula Tuesday night, though it didn’t have a transparent roof, was almost as good. It had a black church and a great dog! After our night at the Buubble we headed back to Reykjavik to pick up our bags and rental car. We made a stop at a volcano that was being excavated for the red dirt (apparently for decoration in buildings and driveways), and took advantage of the Mars-like photo op. Driving in Iceland is pretty straightforward. The speed limit is 90 km/hour, and there are speed cameras, well marked by roadsigns with photos of cameras on them. Our tour guide to the Buubble, Olaf, mentioned the speed cameras several times, and how people kept asking him what the bright light was that came out of them…then were shocked when he told them they would have the pleasure of receiving a ticket by mail. 90 km/hour (55 mph) is painfully slow for a Texan where the Interstates have 75 mph speeds. But off we went. We drove from Reykjavik to the Snæfellsnes Peninsula, our evening destination being The Hotel Búðir. We had planned on stopping at two museums: the War and Peace Museum in the “Whale Fjord” (Hvalfjörōur) and the Settlement Center in Borganes. The War and Peace Museum was (in theory) a collection of memorabilia concerning World War II and the American/British presence in Iceland. Unfortunately we were visiting in the “low season” so there was no one at the museum to open the doors. We would go “0 for 2” with this museum, and later learned that it is a good idea to call during low season; occasionally they will open the museum for you (see the Bobby Fischer Center in another post). So we drove on to Borganes and the Settlement Center, which not only had a good restaurant but two great exhibits about the history of Iceland. After the education we received from our trusty and faithful Golden Circle guide Olaf about the history of the Althing and the meetings at Thingvillir, the first presentation/exhibit in the Settlement Museum was a similar but different perspective on the history of Icelandic Settlements in the area. It featured an guided audio tour that walked through two books, The Book of Icelanders and The Book of Settlement, that document the first 300+ Icelanders and the time from Settlement until the first meeting of the parliament at the Althing. Imagine if there was a “The Book of the Comanche” or any other American Indian tribe that was similar to The Book of Icelanders. The second presentation (also a guided audio tour) went through one of the Icelandic Sagas, Egils Saga. There are about 40 Sagas, all based on historic events of the Norse and Celtics in Iceland in the 10th and 11th Centuries AD. There was a LARGE book in the museum gift store that contained a majority of the sagas (which I did not want to carry across the rest of Iceland), and many of them can be found online. Egils Saga tells the story of Egill Skall-Grimsson, the son Skalla-Grimur Kveldulfsson, one of the very first Viking settlers, and who claimed the land around Borgarnes where the museum was located. There are parts of any country where driving between places becomes tedious and the scenery repetitious. Iceland is no acceptation. The portion of the drive from Borganes until the mountain towards the end of Snæfellsnes Peninsula was all dead yellow grasses. I assume when it is winter it is all white, or in summer possibly all green. But at 90 km/h…it is a chore to get to the next stop…until you get to the majestic mountains again. Our destination, the Hotel Búðir, is right where part of the highway goes over the mountain to Olafsvik (where we were to embark on a whale tour from the next day) and the other part continues to follow the coast toward the end of the peninsula. The hotel is isolated, and it could have ended up being one of those creepy “Psycho” movie hotels. But it was a great place, had a nice lounge, an amazing restaurant. And a cool dog. And a Black Church. The dog was named Igor, and though he was a Rottweiler, kids and others (mainly my wife) petted him incessantly. After we checked in and took off for a walk to shake out our legs from the long car ride. Igor accompanied us past the black church and down to the beach, attack scary lava rocks that might threaten us at any moment. The picturesque Black Church that is close to the Hotel is wooden and surrounded by a equally interesting cemetery. It is one of the oldest wooden churches in Iceland (according to the plaque at the front gate), originally built in 1702 and rebuilt in 1848. There are lots of trails to hike along the coast, but the wind and rain prompted us to decide on martinis and dinner instead. Dinner at the Hotel was outstanding. We had a table on the corner of the building that looked out towards the national park, with antique tablecloths. Like most of our meals, lamb and seafood were the choices, with lots of bread. We retired to the lounge that looked over a small bay to relax and hopefully see the lights (this was the height of optimism since it was cloudy and raining). A young lad staying at the same hotel was telling us about the whale tour he was on the day before, and it was the same one we were to do tomorrow (Wednesday). He said they saw pods of Orcas and lots of other whales, and his parents echoed how much they saw. We awoke to a text and email about “dangerously high winds” on the north coast where the tour was to leave, and a cancellation of the tour. So we did what anyone should do during rain and high winds – we went into a cave. Vatnshellir Cave is at the very tip of the peninsula, in the shadow of Snæfellsjökull, the mountain on the peninsula with, made famous by Jules Verne. With the weather being what it was, below is the best photo we got of the mountain that gives Snæfellsnes Peninsula its name. The tree in the middle was not the elusive Jules Verne Monument….but I may pretend it was! Here’s a handy map of the three sections of Vatnshellir Cave that is on the door to the spiral staircase at the entrance. You may notice that it doesn’t go all the way to the “centre of the earth” as Mr. Verne put it…so even though it wasn’t that cave, it was a great lava tunnel. In the off season the cave opens at 11am, and we were there right on time…sitting in the car as the wind and rain cranked up. We were given hard hats and flashlights, and split into two groups (lots of folks realized going underground during bad weather is a good option!). There is a short spiral stair case going into the first level of the cave, and then an even longer staircase going down the the bottom section of the cave. Even though we had individual flashlights, there wasn’t enough lights for photos unless our guide shown his massive multi-bulb light as something. We showed us a formation that looked like a face with a mouth with sharp teeth. He said his son, who was also a guide thought it looked like his father. The upper section which we visited last is called Bárðarstofa. Our guide told us that Bárðar was a half man, half troll who was a legendary protector in the Snæfellsnes Peninsula, and that he used that part of the cave for meetings with other trolls in the area. This room of the cave had a meeting-like podium area, and an area for a gallery…if you used your imagination. After we left the cave, we stopped at a look out point overlooking a set of volcanic formations called Londrangar. There is a lighthouse behind them that you can see in a photo. 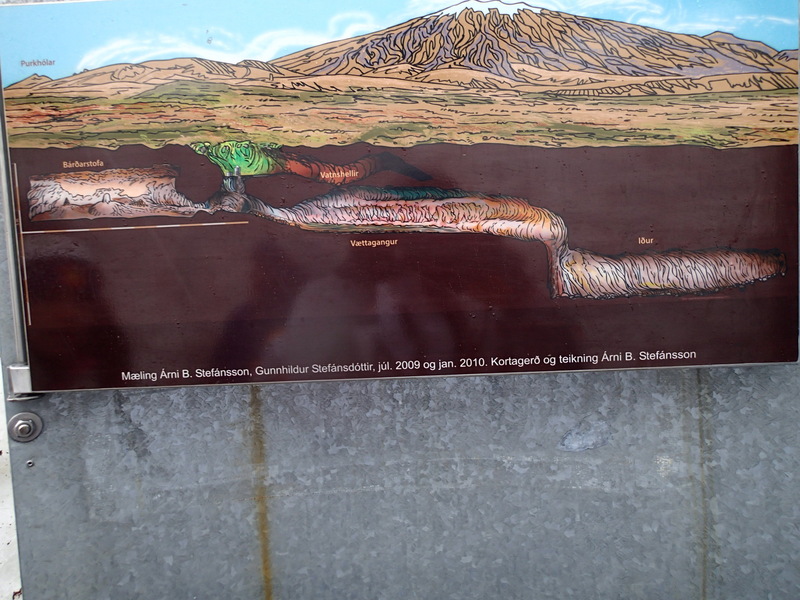 We then started what would turn out to be a futile hunt for Jules Verne’s monument in a small town called Arnarstapi. Google Maps, Waze, Apple Maps all said it was there, and that we were right on top of it. But there is nothing but an empty field (and the stump of a tree show in the picture of the mountain above). Some google articles say there is a sign post, but we didn’t find anything like it in the rain. This would be a great place for a Jules Verne museum! We did find yet another representation of an Icelandic Saga and a statue to the figure mentioned by our cave guide, Bárðar. With the weather bad and getting worse (just stopping to take photos was an adventure), we drove off to escape from the peninsula. Unfortunately since we decide to stay at the Buubble at the beginning of our stay, and the fact that our whale tour on the peninsula was cancelled, we had to back track over a lot of the same road we have covered before. If you see the long inward loop in the middle off the Ring Road between Borganes and Reykjavik…that was our attempt to again see the War and Peace museum. Though the hours said open at 1pm, it was once again locked and empty of people. I called the number on their website, but the gentleman that answered said it was off-season and no one could get there. So we drove on. The loop was pretty scenic, but it added a lot of driving time. Our next destination on a long day was the Bobby Fischer Center in Selfoss.